The end of the Mississippi era was marked by the Europeans’ arrival to what they called the “New World.” Columbus landed in the Americas in 1492. 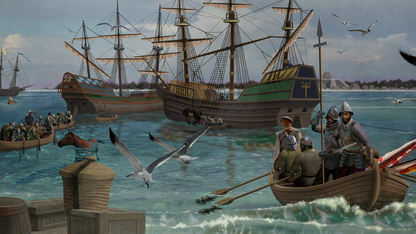 Then, in 1513, Ponce de Leon led the first European expedition to Florida and declared it for Spain. Spanish explorer Balboa discovered the Pacific later that same year. And Jacques Cartier mapped the St. Lawrence Seaway in 1535 – opening the waterway for European penetration of North America. All of these explorers set the scene for Hernando de Soto, the Spanish conquistador and the first European to encounter the Chickasaws. 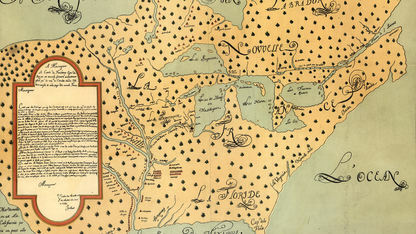 In December 1540, Spanish explorer Hernando de Soto led an army of men across the Chikashsha, or modern-day Tombigbee River. 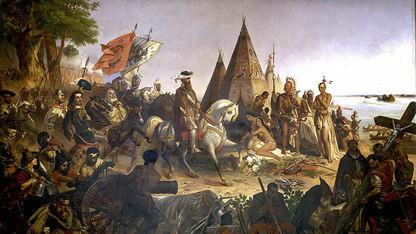 The French were the first Europeans to resume contact with the Chickasaws after de Soto.